The book "A Mentoring Course on Smalltalk" is available on Lulu. Cool: JavaFX integration with SWT. Something new to play with over the weekend! Phoseydon - a tool aimed to model and create applications easily in Smalltalk, as Ruby does with Rails or python with Django. You describe a model, and from that model a relational database plus an object model plus an ORM mapping are fed from that model. The company Teleplace is gone, the software (written in Squeak Smalltalk) is still available and continues to live. Looks like it is not good to rename a project while it already got some attention on the web. The former SqueakDBX is now DBXTalk and you should follow this discussion if you are interested. This time as a video. Read more. The Celeste E-Mail reader in Squeak is back. Read more. Dont know what to do on Sunday, February 5, 2012? You can visit the Smalltalk Devroom at FOSDEM 2012 if you like. Version 1.3 of the Magma database system is available. Read more here. GUI testing in Pharo made easy - if you are interested then read this and this or checkout the project on Squeaksource. It is an experiment from Sean P. DeNigris for Behavior Driven Development (BDD) in Pharo. Interesting post if you are interested in dynamic languages. Thanks Michael for sharing. Lawson English has some videos to share for Squeak beginners. The Fuel serialization framework is (beside Pharo) now also available for Squeak. Mariano knows more. Nick shares an "Pier-admin" extension - an admin UI extension for the Pier CMS (which is based on Seaside). Yesplan is looking for a Smalltalk Software Engineer. Want to use Seaside SSL on Windows. Andreas shows you how to do it! The demo for SmalltalkHub is online now. Take care - it is a preview currently. Found the presentation video from the JVM Language Summit about RTalk to run Smalltalk on the JVM. There is a nice framework from Ken Treis for form validation in Seaside. The project is called "Mold" and available on Squeaksource and the Cincom Public Repo. Read this blog post with a detailed description. Eliot has a new update. HPI provides a new screencast page for Squeak beginners. Interesting video from Nick on how to build an app with Seaside and the jQuery Mobile wrapper. Need a bootable Smalltalk image? Then try this ISO from Pavel. Todor Todorov has created a new project called "IronSmalltalk" on CodePlex to be able to run Smalltalk on the DLR (Dynamic Language runtime). Club Smalltalk interviewed Mariano on Fuel. Moose is written in Smalltalk, and that same philosophy came through strongly in Tudor's talk - quickly allowing you to build first class features into the tool by implementing new functions in a matter of minutes. I like tools - especially usefull ones like Wireshark. "Use wireshark to inspect at what actually went over the wire"
and yes - it already helped me keep the control! There is a new video available showing you how easily you can build new browsers using Glamour. There is a new Newspeak update available. Would you like to run the new Dart language on the JVM - then look at JDart. Squeak Smalltalk system that runs on the 64-core Tilera chip. All videos of "Deep into Smalltalk" are now available online. Dont want to compile Dart for yourself. There is a precompiled binary here. Dimitry has some more infos on CogDroid - beside the ARM devices there is now also Android-x86 support available. Revision #2499 of CogVM is available from Eliot. Jamie Douglass, Ralph Johnson and Nick Chen work on an experimental language workbench called Language of Languages (LoLs) that focuses on unifying concepts (meta-models) across different notations. Read the announcement here or visit the new website http://www.languageoflanguages.org. There are some infos, slides and photos available from the Bangalore Smalltalk meetup. Smalltalk is a nice environment for creating simulations - especially since the results can interactively explored. There is a new project on Squeaksource implementing an Hydrodynamics Simulation Environment. Check out the class side of class HGSimulator for a few examples. Nick provides a new framework for Seaside and JQueryMobile integration. You can read more here and try it here. If you want to combine the client side Amber with the server side Seaside framework and Monticello then look at the new Kaliningrad project. Dimitry reports again on the status on Cog for Android. Read more. Interesting overview on the RoarVM. There is another Smalltalk Stammtisch Zürich on Tuesday, September 27, 2011. Read more. We have seen many new languages in the last few years (from Java, C#, Ruby, Scala, Clojure, Go, ...) - most of them with old and known concepts mixed with different syntax. But nothing really new. I tried nearly all of them but nothing hit me like Smalltalk did back when I understood all of its concepts. To me Smalltalk is still outstanding since it is not only a language - it's language is only mapped to "the dynamic object system" underneath that the Smalltalk runtime provides. And having such a dynamic object system is the key factor in programming. Many people are "blind" and dont see this since they compare languages by syntax or features or check if a language is highly ranked in silly comparisions like the TIOBE index. IMHO one of the reasons why Smalltalk is so poorly ranked is that Smalltalk (if seen as a programming language) maps to objects and messages - thats not what people know from other languages and if they look at Smalltalk code this is not what the usual programmer would expect regarding syntax. But there is this expectation among programmers to learn new keywords and syntax rules with any new programming language. This is how most books teaching programming languages start: learn the keywords, then language control structures and then start coding. There is also this expectation to use nice wizards to create new classes or writing source code in text files followed by a compiler step. Smalltalk is different: here you only need six keywords or just send a message to a class to tell the system that you want to create a new subclass of it. So anything is an object and understands messages - even classes and block/closures. Anything is changeable, anytime - even at runtime. So Smalltalk as "a dynamic object system" is superior - and will continue to be so - since a dynamic environment is easy to change (even the language built on top). If you want you can even cleanly blend in different other more mainstream languages into this dynamic system. You can even make a snapshot of this virtual object system (an image file) and continue with your program or debugging session the next day. Our world is a dynamic system too - full of objects. Thats why Smalltalk is very close in bringing real world concepts to machines and computing. But even Smalltalk systems have to be enhanced - there is so much power in the meta facilities of these dynamic environments and Smalltalk still doesn use all of its power here. Meta informations usually are used for IDE tools - but if extended they can allow you to build applications nearly automatically (maybe more on this in another post). This is the field where Smalltalkers have to learn and catch up. And what about Dart? The people behind Dart know that Smalltalk is not only a language, they worked with the underlying dynamic object system and understand it down to the bare metal. If they have reused and transfer this know how and knowledge correctly into the design of Dart then this new programming language is a chance to again bring dynamic object systems into the focus and raise programmers attention. So will Dart just be "yet another language" with new books teaching you yet another new syntax or will it be a real step towards more dynamic adoptable and flexible runtime systems? So Pharo 1.3 is now officially available on the pharo-project.org page. As I reported earlier there is some help if you want to run your windows application written in Dolphin Smalltalk also on Mac. Now there is a new blog post that explains all this in detail. The ESUG channel on Youtube has new videos available. Read more. A new database conectivity API and its MySQL implementation was announced by Anindya Haldar for Squeak and Pharo. There is now an ESUG Smalltalk channel on Youtube. There is an updated port of Glorp for Pharo. Nice! Mariano is working on fast package loading for Pharo using Fuel. Impressive: 7 seconds for loading Seaside - he will report soon on his blog. The Amber IRC channel is now logged. There is also a Twitterwall implemented in Amber. With this new screencast released one can get the impression that Andy from ObjectArts released a Mac OSX port of Dolphin Smalltalk into the wild. For those who dont know Dolphin - it is a very nice Smalltalk system - but with history and focus on Win32 platforms. Now natively ported to MaxOSX? Really? The end of a second screencast here showed that its not a real native port - he uses Wineskin, a tool used to make ports of Windows software to Mac OS X. Wineskin is based on Wine. I like all these virtual boxes, emulators and stuff. The platform question is nothing one really has to discuss first (in most cases). I can even run my old C64 stuff if I like. There is an updated version of Seafox for Seaside, now with an HTML to canvas translator. It's helps you building real Seaside apps from existing HTML templates. Eliot ported Method wrappers to Squeak 4.2. If you know VisualWorks you may already know that Method Wrappers can add hidden behavior to a method without recompiling it. It is a very useful package for implementing coverage and tracing tools. The Klotz project implements an Agile 3D Visualization Engine. It is written in Pharo Smalltalk and is freely available on Squeaksource. There is also a paper for a short introduction. The Pharo 1.3 one click is now available on the Pharo download page. There is a Smalltalk meetup in Bangalore. There is also an invitation to VMIL workshop that may be of interest to you. You are invited to the 5th Argentine Smalltalk Conference - read more here. There is now a video online from Yesplan - a software written in Smalltalk using the Seaside webframework. It runs on Pharo with GLASS for persistence. Frank plays with extending SUnit with theories. Here are some more rumors on a possible relationship between the new Dart programming language from Google and Smalltalk. Mhhh ... and we also know that Eric Clayberg is now also working for Google. Is it possible that Dart is the next fast and modular Smalltalk implementation that is deployed via Web browsers like Chrome? There are also some infos from back in 2010 available on the net. Let's see what the keynote will reveal and if Google is able to suprise me here. AFAIK Google will publish more infos on it's new programming language called "Dart" on GOTO conference in Aarhus in October. Dart is according to various sources a new structured programming language designed for the web. Can we therefore expect it to be more Smalltalk like? Dont know ... but in a month we will see. Want to get a free developer preview on the new windows. Then look at MSDN for the ISO files. JTalk is now renamed to Amber and it has a lot to offer now. is available. See the announcement, you can use the updated ConfigurationOfSeaside30. TextLint is a tool to check scientific writing for common style errors written in Pharo Smalltalk. There is now an integration into Emacs and TextMate. There is also a web version available online. Since squeaksource.com had several outages in the past the VMMaker package (the one you require to build the Squeak and Pharo virtual machine) has now moved to another squeaksource instance: http://source.squeak.org. You want to Test Cog virtual machine to run Pharo on Android devices. Try with the initial relase of CogDroid. Smalltalk is different - and even after years I get rembered by discusssions from time to time how different it really is! Smalltalk is a real dynamic object system (with the language just built in) and unique in the world of computing. In Java you may call it foo() or bar() or negated(). But in Smalltalk this selector could be ANY object. Yes, yes - this is not a typo. existingMethod := EllipseMorph methodDict at: #heading. EllipseMorph methodDict at: selectorThatCouldBeAnObject put: existingMethod. EllipseMorph methodDict at: receiver put: existingMethod. Alan Kay once said that "Smalltalk is object-oriented, but it should have been message oriented." You want to control your home robot using Scratch? Then look at ROSScratch project. I've wrapped the MIT licensed dynatree widget as part of the JQueryWidgetBox project. So if you need a tree in your web app just try it. If you want to know more why Bombardier is using Pharo and Seaside then visit the next TSUG meeting in Toronto on Sep. 12th. Francois Stephany reports on his experience with using Pharo and Seaside to develop a web application. Pavel created a small seaside image based on the small Pharo kernel image. So you could have a running seaside app in 4.3MB. So the app is not closed correctly and error free. to trigger an initialization that is required to prevent the above problem. Thought I would share this if others run into the same problem. Another possibility is to use a better system. Airflowing, a new seaside application isn’t invite-only anymore - so anyone is able to use their commercial service. Read more or try it out. FSGit got an update to the new Filesystem implementation. Read more. an old but interesting blog post to read. An update: watch the video called "A Renaissance VM: One Platform, Many Languages" on this site from Oracle. Highly recommended if you are interested on Smalltalk and (J)VM's. Note that with JSR292 there is more support for dynamic languages on JVM. Found a presentation about the "RTalk" project to run Smalltalk on JVM and there is work going on as this message from the open jdk mailinglist proves. Even when it runs on JVM - I still expect it to be limited compared to a Smalltalk running on a Smalltalk VM. The future will show if I'm right. The book Pharo by Example is now translated into Spanish too. Gary Chambers (creator of the Polymorph UI framework for Pharo) is currently building an image capture, OCR and data processing system using Smalltalk and he provides a first screenshot. His company Pinesoft is using Smalltalk a lot as you can read here. Nice! VMware (formerly GemStone) is sponsoring the Seaside sprint after ESUG. Thanks! Stef shares two new chapters for the Pharo book. You can also find them here. This time on floats and little numbers. Feel free to review and send comments to him. Tudor Girba published a tutorial on how to use the PetitParser as part of the moose book. Refactoring Browser, Packaging Software like Monticello and other Smalltalk tools mostly work on their own code/meta model. What about a unified model? and the latest updates now try to integrate Ring. There is also a presentation available. Binary Literals - a new feature of Java 7. So beside 0x... notation for hexadecimal you can now write 0b... for binary. What a step forward (for the Java community). If you want to integrate LDAP authentication into your seaside app then read charlies blog entry. As you may know Pavel is working on Pharo Kernel - a small Smalltalk kernel that is stripped down from Pharo Core image. Meanwhile there is also a 3MB Pharo-Kernel-Gofer image available that has networking support and Gofer (a pharo installer to load packages) installed. With this it is possible to reload back the various packages from Core image on top of the kernel image. By running the tests afterwards it is possible to check if anything is OK. So far the result is very promising and since all of this is automatically built using the continuous integration server it is possible to control changes and watch progress. Really a great step in the modularization of Pharo Smalltalk images! There is a new Moose release available. Read more. Tudor has a new home for success stories of his humane assessment method based on Moose (which is based on Pharo). Read his announcement or visit the new page. Beside Fuel there is now also a second Pharo project for binary serialization available. It is called StOMP (Smalltalk Objects on MessagePack) and the code is running on Squeak, Pharo and VisualWorks. Read more. There is a new shiny Seaside 3.0.5 release available. Read about Oracle vs. Google. Maybe Google should have used Smalltalk instead of Java for Android. They were so close but blind. In his Spoon project Craig maps Smalltalk to WebDAV, so he can use his favorite text editor to edit. If you build a seaside application like Nick did with getitmade.com then it may be usefull to get a quick overview of your page visits. A small tool announced by Esteban can help you here. Just load it in a seaside image using the ConfigurationOfGoogleAnalyticsTracker. The tiling windows manager for Pharo (a usefull tool to control the many windows on your desk) now also supports multiple worlds. It's not the same as in Squeak where "World" means a separate storable/loadable project with own changesets - more in the sense of multiple desktops as you may know from usual operating systems. There is a screenscast available to demo all the new features. Guillermo Polito announced a new Glorp port for Pharo integrated with DBXTalk (the former SqueakDBX). So if you want to map you classes to a RDBMS schema and store your objects into database tables you should take a look. Note that Glorp is still LGPL but currently in the process to be MIT licensed. Nick has some tips on Continuous integration using Jenkins and Smalltalk. Juan released Cuis 3.3. with more improvements. Read more. Need only a simple REST server on top of Pharo? Guillermo shows you an example with only KomHttpServer loaded and a custom service. No need for frameworks like Seaside. Vanessa, a student at the University of Chile presented Hapao, a Pharo application at the ACM Student Research Competition (sponsored by Microsoft Research). Details here. She arrived 2nd in the category undergraduate student. Congratulations! Looks like Scratch gets ported to Pharo: at least there is a project on Squeaksource. 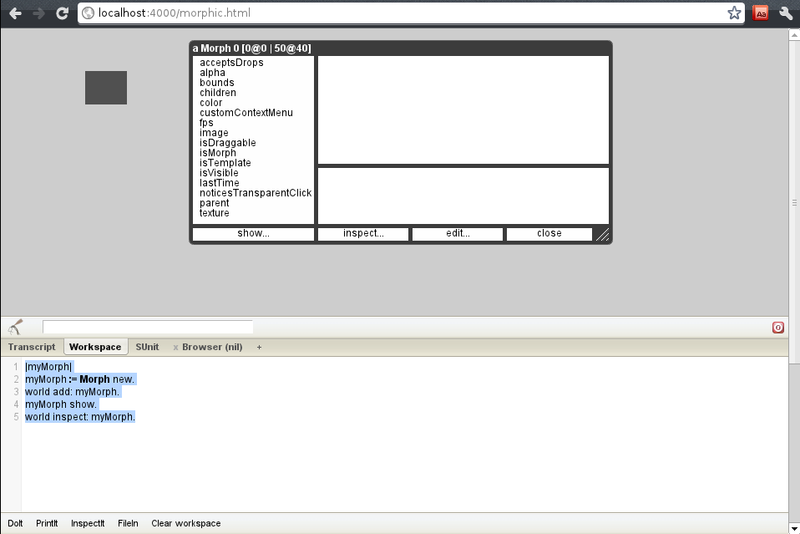 After loading and running "ScratchFrameMorph open" you get the basic UI of scratch. Nice. Dale announced a new SqueakSource3 site. Note that this is for testing only and be aware that the repository will be refreshed at the end of the Alpha period. ((Smalltalk at: #ConfigurationOfFuel) project latestVersion) load: #(Core Tests Benchmarks). It's smoking fast compared to SmartRefStreams. A 200 object commit with SmartRefStream on test machine takes around 2.2 seconds, .41 seconds with Fuel. This will of course invalidate any existing db based on SmartRefStreams. To migrate, simply resave all of your objects. This would require grabbing all objects first into some temp arrays, changing the serializer, then calling save on all objects. So startup Pharo and try it out. Steven Kelly demonstrated the MetaEdit+ implementation of the assignment. In fact, he implemented most of the assignment from scratch during his demonstration! Very impressive and the only one who did it this way. For me, this shows the productivity and ease of use of MetaEdit+. The main comment on twitter about MetaEdit+ was that its UI looks a bit old-fashioned. That's of course a matter of taste, but their next version (5.0 - to be released soon) will have a new, Windows 7 looking UI. So the next version will have a Windows7 UI. CST catches up with current trends - good. But the question to me still is what is next step in UI development? Is it really worth to following UI design of the native platform. Or should we focus on the nice things that can be done in browsers and other rich clients today? Or should we focus on 3D Smalltalk? If I look at all these new devices and apps then I think an application that looks "modern" should at least support graphics and animation. Mhhh ... time to look at morphic again? What is the (Smalltalk) application with the most "fashionable" UI? You can decide if you implement/reuse a widget/webapp in HTML or implement it in Java(FX). I remember an example in Smalltalk/MT where it was possible to get a callback into Smalltalk on events generated from the scripting engine in Internet Explorer. So a Smalltalk window was able to display a webpage by embedding IE and when you clicked in the webpage you could handle this in your Smalltalk app. But it was only possible with deep knowledge of IE and its COM interfaces. JavaFX also provides Swing Interoperability - so you can use existing Swing widgets or integrate a JavaFX stage/scene into your Swing app. You can also style your app using CSS similar to a webpage. You can run a JavaFX app easily as applet, webstart or local application. It is very deployment friendly and you can even develop apps that run on a TV. Let's see if it will also have a future on mobile devices/platforms. Yes - JavaFX is really nice and opens new opportunities. Tried the new JavaFX beta 2.0 ... looks good so far. Some small graphic errors on my machine ... but could be nice to build visually attractive rich client apps. Want to learn about the eToys system in Squeak. There are nice screencasts available on the Waveplace website. He did more experiments to make sure calling Java-Classes from JTalk-Smalltalk is possible too. Today Stefan left a comment on my blog post on "JTalk and JSTalk". He announced that the execution of smalltalk-code on the server-side via Rhino is possible. Details on the remote runner and how you can save your Smalltalk Code to a DB can be found on his blog. I still doubt that performance would be good. It would make more sense to run it on Googles new Native client. Now select a directory with images. Nice. There is a new release of Dr.Geo - an app built with Pharo Smalltalk. Fuel - a new project to implement binary object serialization for Pharo is part of the ESUG SummerTalk. It's work in progress but already usable, there is a ConfigurationOfFuel metacello config to easily load it. Read about the details here or on the project website. The Source code can be found on squeaksource.com, there is also an issue tracker. According to the benchmarks its faster than SmartRefStream. It is very easy to serialize and materialize (deserialize) an object, you can store blocks (that get evaluated when loaded again) and Fuel takes care to keep global instances like Transcript. with: [ Transcript show: 'a string' ]. FLSerializer serialize: sourceArray toFileNamed: 'example.fl'. loadedArray := FLMaterializer materializeFromFileNamed: 'example.fl'. You want to know more about how the virtual machine of Pharo works? Then go to Marianos blog - this time he gives an introduction on Smalltalk bytecodes. Igor implemented Ephemerons for Cog and Eliot explains why they are usefull. You can also read a paper on this topic. James talks to Stef about Pharo's Future. Listen here. Need some easy visualizations in your application written in Pharo? It is easy to create diagrams with it. Check out the examples in class "ESExamples". I tried it in Pharo 1.2 - some examples were broken since the class Circle was removed. This is currently discussed on pharo-list. However - it's easy to fix. JRockit (a fast JavaVM similar to Hotspot) is now free and available on Oracles Tech net. Nice! There is a new video available about Cuis (a Squeak fork) and Juans Morphic 3 implementation. via Joachim: ESUG 2011 registration is open. Thanks to James Pharocasts now includes a screencast on using ProfStef to learn Smalltalk. The Belgian Smalltalk User Group (BSUG) is organising its next meeting on Tuesday May 31. Read more. With the support of ESUG there is a new ESUG SummerTalk 2011 project called SmallHarbour. It wants to provide a simple platform to host smalltalk web applications (similar to seasidehosting.st but also for commercial projects. Read the announcement here and follow progress at www.smallharbour.org. Tudor announced the new Moose Suite in version 4.4. Read more. Remember the 100$ Laptop. Now there is a cheaper alternative: 25$/£15/17,5€ for a Computer. You try it in the latest update of Pharo core 1.3 image. Read here. Looks like Sebastian Heidbrink ported the JQueryWidgetBox project for Seaside to VA Smalltalk and uploaded it to VASTGoodies.com. I started the JQueryWidgetBox project in November 2009 and meanwhile various people contributed wrappers for seaside widgets to it. There are so many good jquery plugins available that could be wrapped for seaside and make the web apps look much nicer. Feel free to help. Pharo once forked from Squeak ... some people were happy, others angry. And there were IMHO unnecessary posts like this. However - Squeak is still alive and growing. As well as any of its forks. Pharo and Squeak play nicely next to each other and both communities not only share history and virtual machine but also members and code/fixes. Pharo took away the pressure from Squeak to be more like other Smalltalk IDEs. Squeak could continue to be the media and etoy Smalltalk. It's still the best environment to experiment with computing ideas. And we can now use Pharo to introduce business people to (open source) Smalltalk as these two new indendent posts again prove: read here and here. So IMHO I think it was a good step, especially since other forks like Cuis started to explorer new areas too. There are also other nice forks like the Squeak NOS project or the Croquet/OpenCobalt story with Krestianstvo and the new OpenQwaq. Cool! I started with Squeak in version 1.0, right after Andreas created a VM port for Windows and helped to move it forward with code and words. Currently I concentrate on Pharo, otherwise I would be lost in all these nice projects. But I follow all the Squeak forks very closely. It is really exciting to see all these different faces of Squeak and Smalltalk in general. Yoshiki Ohshima started a Squeak VM port to Google Native Client. If you work with latest beta of Googles Chrome browser you can try it yourself. Native client is a technology where native code (subset of Intel x86) could be run from a web browser within a sandbox. A modern aspect language for Pharo was announced today. The OpenQwaq project is based on the commercial software that Teleplace has been delivering to the market over the past four years. It is a highly-secure, enterprise-class virtual collaboration platform that has been used by large commercial enterprises and federal agencies. The OpenQwaq project enables organizations - large and small, profit and not-for-profit - to implement virtual workspaces for their specific needs. Some more infos here and here. Follow Smalltalk ANSI standard ... or intuition. An interesting issue in the context of Pharo. Ben Coman has some nice posts on Morphic performance testing. The theme for this year's conference will be "How and why to use Etoys in the education". If you want to work with the Magma OO-database in Pharo you should check out the updated ConfigurationOfMagma. Scratch is is very nice very visual language in order to do animation and control also embedded systems. It is written in Squeak Smalltalk. I think that is the reason why I like Smalltalk so much ... you can constantly improve your situation as a developer by improving anything within the system: starting from the language, the tools up to config management and deployment very easily. Tobias Pape announced SqueakSource3 Beta.1 called "Easter Fire" - a port of SqueakSource to Seaside 3 and Magritte 2. SqueakSource is a monticello code repository server which hosts your Smalltalk projects. You can simply load it into Gemstone, Squeak or Pharo using the provided ConfigurationOfSqueakSource. You should load Seaside 3.0 first. ((Smalltalk at: #ConfigurationOfSeaside30) project latestVersion) load. ((Smalltalk at: #ConfigurationOfSqueakSource) project version: #easterFire) load. Camillo Bruni worked a bit on a pharo web documentation tool using Seaside. It's a derivate of ruby's yardoc. You can download a test image and try it yourself. The chapter on "Glamour" was updated in the Moose book. So if you want to use this framework to easily build browsers then go and have a look. A first public demo for Smalltalk Hub is now available online, only use it for testing purposes. In the future this could be a nice replacement for Squeaksource. It was written by ObjectFusion using the Iliad web framework and still a work in progress. The project is sponsored by ESUG. So far it is an alpha demo - although a very promising one. Dimitry Golubovsky has reached another milestone on the Squeak Port for Android Tablets. Read more in his announcement or on the test drive page. Chris announced a new version of his Magma database. Magma 1.2 is running on Squeak 4.2, Pharo 1.1 and Pharo 1.2. A new screencast on test coverage with Pharo and Hapao. Nice! Yet another website written in Seaside (together with GLASS). Nice! Juan released Cuis 3.2. with an enhanced Look and feel. There is a new Seattle Smalltalk user group. The Seaside Tutorial was updated for Seaside 3.0. Looks like there is a Smalltalk port running on Open JDK. Have to find out more. At ESUG 2010 there was a presentation about Next Generation Event Planning in Seaside. You can get all the details about the release here. We have an impressive number of tests ( 7836 Unit-Tests for core, 10760 Tests for the Pharo 1.2 dev image), new tools and a new UI theme. And the system gets cleaner and cleaner! Short tip: you can easily load and run Seaside 3.0.31, the included developer workspace will tell you. SmalltalkHub a new project hosting application for Smalltalk and Monticello projects is going beta in a week. The project is sponsered by ESUG. Today Nicolas published an early preview screenshot. Read more. Stéphane updated the chapter on how to use Metacello package configuration system for Pharo. Click here for the PDF. The server uses Zinc HTTP Components, both for its server part, as well as for clients talking to other systems behind the scenes. Even the Open Street Map tile serving, which is pushing out many megabytes, is currently going through this server. Johan Brichau and Andy Kellens are organizing a Pharo sprint at Brussels Friday 15th of April. Get the details here. Mariano Martinez Peck now also has a blog and starts with a journey through the Virtual machine. The Seaside REST interface got an update for better matches. Doing REST in Seaside is simple - just use pragmas. HwaJong Oh implemented a PocketCube Solver in Pharo. Read his announcement here or watch a video here. Code is available on this squeaksource project. You can try morphic.js in your webbrowser or read the programmers guide. New Cog VM version from Eliot. The Cog virtual machine for Pharo and Squeak now also has a project home at http://code.google.com/p/cog/. And Igor is working on automated hudson builds for the VM (see docu and first results). A new update on SqueakNOS is released. Nice! SqueakDBX 1.3 is released. This is the last release with this name. In the future the project is called DBXTalk. Esteban now started teaching Pharo at San Martin University Buenos Aires Province. Performance would be bad ... but it would be fun. Did I mention that Diego Lont and Stephan Eggermont participated in Startup Weekend Eindhoven. The combination of Seaside on Pharo made it possible they were honored by the jury with the innovation price (Most Innovative Business Case). So you should really think about using Smalltalk for your next startup! Yes there is still life on Mars (project). Runar Jordahl implemented a Riak Interface for Pharo Smalltalk. Why is this interesting, you may ask. Runars Interface runs in Pharo 1.1., uses the ZincHTTP components and is currently in beta. Check out the included test case "EpigentRiakRestConnectionTest" to see how easy you can use it. You have to set up a riak running at "http://riaktest:8098/riak" if you want to try. I hope to find the time to play with this a little bit more. Patrick Barroca announced two additional themes for Pharo 1.2. You can download them from Squeaksource. Looks like Squeak NOS (No operating system) will soon get an update. One of the coolest project I've seen ... booting a Smalltalk system without an operating system. Have to try out as soon as it is available. Pharo Core 1.1.2 is released. This is 1.1. with additional fixes. So Pharo 1.2 is the new stable and a prebuilt final can be loaded here. Please test and give feedback. So why not switch to something much simpler right from the beginning and care about real world problems. Do you know Tron - the movie. Sure. But how is this related to Smalltalk? Alchemy is a research project from Adobe that allows users to compile C and C++ code that is targeted to run on the open source ActionScript Virtual Machine (AVM2). Here are some more notes on this. After Dale finished the metacello configuration the new "Seaside 3.0.4" is ready now. SqueakDBX is a nice interface for accessing relation databases from Smalltalk. It is now once again supported by ESUG. Next steps will be an updated name (since it also works for other Squeak forks like Pharo) and an updated Glorp version (OO to RDBMS mapping layer). Panu Suominen now also announced a project for simple object pooling that you can use to pool database connections for SqueakDBX. Cuis 3.1. is available from Juan. It is faster regarding UI performance and has support for MCZ files (Monticello). Juan also made a small 2MB image available that is based on Cuis 3.1. SIXX (Smalltalk Instance eXchange in XML) was updated to work on Pharo 1.2 and Squeak 4.2. SIXX allows you to exchange nets of Smalltalk objects between various Smalltalks. A Smalltalk image is a file where all the objects are persisted (similar to an OO-database). You can at any point in time save the state of your object world to continue later - for instance continue debugging a problem the next day. The image concept is often confusing for people who are used to building a program by compiling source files to a binary. An image is typically maintained over years - and it is possible that some of the objects within a smalltalk image live there since Smalltalk-80. An image can grow in size over time and sometimes one starts to load code/objects into a smaller one to create a new clean image file for daily work. At Pharo-Project we currently have a PharoCore image that is cleaned up day by day and that is used to build the Pharo-dev ("Pharo") Smalltalk distribution. Pavel also worked on a much smaller kernel (Pharo Kernel project) by throwing out more classes. I already reported about his work. However - all these were built by stripping an existing image. Combined with more VM support in the future this will allow for small kernel images that provide textual interactivity (replace your bash with Smalltalk scripts, ...) or small webserver images, etc. Lawson shares a picture of a multi avatar cobalt. Joachim, Marten and Sebastian talk about Smalltalk versions and events. The Squeak VM had problems on Linux caused by using UUID's. It was not a Smalltalk or VM problem - but a bug that exists in some versions of libuuid on some Linux distributions. This bug was really annoying since from time to time someone complained about it (either on Squeak or Pharo lists). This was now finally fixed by Levente Uzoni and he is now honored with the "Best Creative Hack Of The Year" award by the vm-developers. Thanks Levente! With the CloudforkSSO library you can let the users of your Seaside web application login using their Google or Yahoo accounts. Cool! James Foster updated the Seaside 3 Tutorial for Gemstone. There is a call for papers on the IWST @ ESUG 2011 (International Workshop on Smalltalk Technologies in Edinburgh, Scotland). Read more. There is a new large Argentinian application based on Pharo. Read more here. Java Virtual Machine (JVM) where Java code is executing. Good news for the version 2.0: JNIPort can now be used in Pharo and Squeak. Funny (hi)story on the Smalltalk collection protocol! It's hard to remember long URL's. At least for me. Stephan Eggermont and Willem van den Ende will demo Seaside at the FOSDEM meeting in Brussels, Belgium to free and Open Source developers. Read more here and the official site. Phillipe updated the AJP adaptor for Seaside. So if you already run Apache in front of your Seaside image feel free to update. Pharo gets more support for running headless (without a UI). I already reported about using SSL for Seaside with SqueakSSL. Now I found a nice HOWTO on Andreas blog. Will try out as soon as time permits. The TestMock project was updated and is now available for Pharo 1.1.1. Hapao is an innovative test coverage tool for Pharo. Read more. Small introduction to Coral - so you can use Pharo for scripting. Read more. "I found that if I write the tests at the same time as I code the forms, this all goes pretty fast. The advantage is that instead of using the browser for minutes to manually test the few things that I think I might have affected, I can run a whole regression suite in a few seconds." Yes, Smalltalk makes this possible and the interesting part is that you can even do this in an XPStyle (write the test first and then create the #renderXX: methods for the seaside components). Instantiantions has set up a new CampSmalltalk wiki. Joachim knows more. The old wiki is not available anymore (since around 2007), but fortunately there is a way back machine archive. Looks like Oracles lawyers check the license of NetBeans code. It may be possible that JUnit is removed from the standard Netbeans installation if it doesnt change its license. Another crazy story of lawyers and software. Pharo 1.2 (on top of the already read 1.2 core) is nearly finished. Time to already start a 1.3 core.